Genevieve Geraldine “Jenny” Roe, 88, passed away peace-fully March 2, 2016 in Olathe, KS. She was born September 10, 1927 to William A. and Rose M. (Bauer) Pretz in Kansas City, KS. Jenny grew up in Kansas City, KS until her family moved to rural Olathe during her high school years. 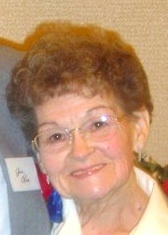 She attended Olathe High School, graduating in 1945. Jenny met the love of her life, Joe D. Roe, during her senior year. After his tours of duty in the Navy, they were married on February 16, 1952 and would have celebrated 64 years of marriage this year. Jenny was a stay at home mom until her youngest started school. She went to work with GSA, a branch of the U.S. government, in accounting and became the department payroll supervisor. She also baked and decorated all styles of cakes, from birthday to multi-tiered wedding cakes. She joined cake clubs, went to cake conventions, and forged friendships that lasted even after she was unable to continue baking. Jenny loved The Lord, the Catholic Church, and most of all her family. Jenny believed with all her heart this earthly journey was a prelude of a heavenly reward. Her faith was unshakeable. She was the best mom in the world. Jenny was preceded in death by her husband Joe; her parents; sisters Frances Baarson, Betty McCray and Rosemary (Billie) Reider; her adopted brother Martin Conroy; and beloved son-in-law Steve Banholzer. She is survived by her loving children Patricia (Ken) Chubb, Gardner, KS; Richard (Jo) Roe, Olathe, KS; Mary Banholzer, Olathe, KS; Kathleen Gordon, Overland Park, KS; and William (Linda) Roe, Salado, TX. She is also survived by 14 grandchildren, 17 great-grandchildren, and 1 great-great-grandchild due in June. The family will receive guests for visitation at Penwell-Gabel Funeral Home in Olathe on Monday March 7 from 6:00-7:45pm with recitation of the rosary to follow. Funeral Mass will be Tuesday March 8, 10:00am at St. Paul’s Catholic Church in Olathe, interment immediately following at Oak Lawn Memorial Gardens. In lieu of flowers, donations to St. Paul’s Catholic Church would be appreciated.